From Durango: Take Hwy 160 E. to Grandview. Just after you go under the overpass, turn left on Davidson Creek Road and follow it around to Owen Road. From Bayfield: Take Hwy 160 W. In Grandview, pass through the light at Three Springs/Mercy Regional Medical Center and turn on Davidson Creek Road, then follow it around to E Owen Road. 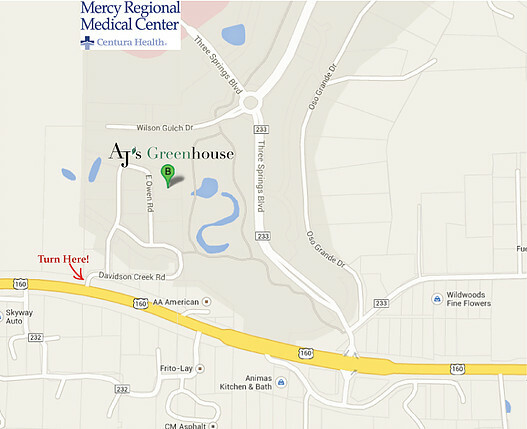 Please note, you can NOT access our facility from Mercy/Three Springs; you must turn off Hwy 160. We are near The Pet Resort and Southwest Appliance.